If you ask old-timer automotive enthusiasts – and by old-timers we mean those who’ve been in love with cars well before the Internet and YouTube came along – there are a few cars and badges that virtually all of them will name as being iconic. Sure, there are the usual Ferraris, Lamborghinis, Porsches, assorted Mercs and BMWs, but there also always is the Mustang – always! We remember, even as kids, the sight of a Ford Mustang in the flesh was a thrill unmatched by most of the much more expensive cars of the time. And this is not just India that we’re talking about. The pony car, which debuted in the 1960s with its distinctive design language, was recognized the world over – perhaps made even more famous by Hollywood style icon Steve McQueen and the cult classic move Bullitt, with its legendary car chase scene through San Francisco. But why it’s taken them over half-a-century to manufacture a right-hand drive version of this iconic machine remains a mystery that only the boffins at Ford can answer. In its latest avatar, the Mustang retains the design characteristics of the original. It maintains that classic long bonnet and short boot design so immortalized by sports cars the world over. And with its subtle design hints, such as the bulges on the bonnet and wide rear haunches, it hints at the large 5-litre V8 nestled under the bonnet – providing the Mustang with 396bhp and 515Nm of torque. Helping transfer this power to the rear-wheels is a six-speed automatic transmission, which is the only gearbox option available in India. As far as the interiors go, there’s a definite look and feel of Americana in the Mustang. So, you get big, comfortable, yet well bolstered, bucket seats in the front – which hold you snugly and yet feel comfortable enough to enjoy long journeys in. There are two small rear seats too, but given the amount of space available these are suitable, at best, for small children. The leather-covered dashboard gives the interior a feeling of luxury, and there’s a fairly intuitive touchscreen infotainment system that works quite well. However, to be honest, the plastics quality can’t be compared with products from the German manufacturers. The real pleasure of the Mustang, though, is out on the open road – which is where this car excels. The performance of the smooth revving, and nice sounding V8 is very easily accessible and the on-road performance gives you the kind of thrills that one would hope for looking at the Mustang in the flesh. When pushed, acceleration is fast, with a soundtrack to match. And, yet, even on uneven roads, the car feels stable and comfortable. On the track, however, there are additional benefits – with the Mustang proving to be one of the easiest cars to power slide, with very forgiving handling characteristics. 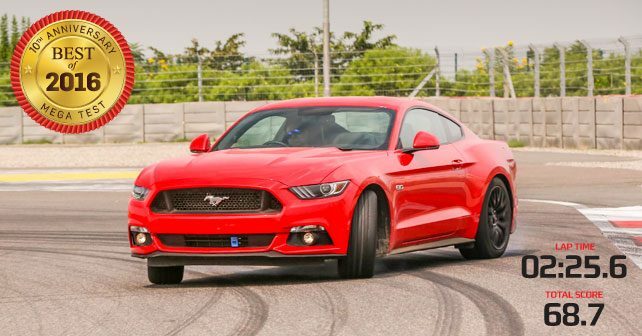 However, it’s at the track that we wish that Ford India offered the Mustang with a manual gearbox too – as it would have taken the performance and fun quotient to another level completely. One of the biggest benefits of the Mustang, though, is that it has good ground clearance, a comfortable ride and a rather manageable size – and so it remains one of the few true sports cars that can be used everyday in our conditions. In fact, given its comfortable seats and ability to munch miles at a very swift pace, this is perhaps one of the few true Grand Touring cars that are relatively suitable for Indian conditions. Of course, an added advantage to driving the Mustang is the amount of attention it gets on the road – which is nothing less than an Italian supercar. And, given its price point, none of its logical competitors come close to the X-factor and the sheer drama of owning a muscle car. So, with its handsome design harking back to its classic roots, a powerful, rumbling V8, plush road manners, and a relatively reasonable price, it’s hard not to choose the Mustang as our top pick for the year. Now, if only Ford would sell it with the option of a louder exhaust and a manual gearbox… Dammit, we’ll never be satisfied – will we?